This squirrel found an unlikely water source to quench its thirst in the blistering heat of the Grand Canyon - a tourist's water bottle. 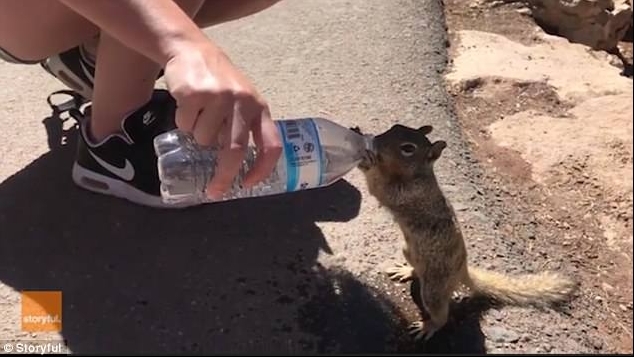 Cute footage shows the little critter in Arizona gulping down the refreshing liquid while holding the bottle in its paws - and drank the whole lot. The hand supporting the other end of the drink belonged to Paul Camps, from Gloucester, who recently visited the Grand Canyon National Park. He was admiring the views in the park, where temperatures hover around 87F at this time of year, when he spotted the squirrel acting peculiarly. The couple quickly realised that the squirrel was thirsty and wanted a drink. Mr Camps held out the open bottle and the squirrel drank from it until empty. 'Needless to say we didn't drink from the same bottle,' he joked. 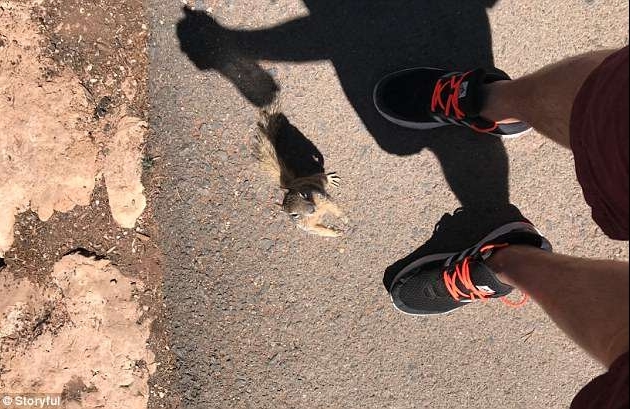 The Grand Canyon National Park Service advises that visitors stay a safe distance from wildlife - in the case of squirrels, about 50ft (15m) away. And there is always the danger that if you get too close, you may get scratched or bitten. Responses to "Thirsty Squirrel Asks Tourist For Water At The Grand Canyon"